At the beginning of 1919, Chicago seemed like a city poised for a wonderful future. It was a time before the Great Depression and Prohibition, and after the end of the Great War, and the mayor had great plans to revolutionize and beautify the city, a feeling of optimism was only to be expected. For the first half of the year, it appeared that this optimism might not be misplaced, but over the summer everything changed. It started on July 21, 1919. Along the lake shore, the Goodyear company was showing off their new blimp, The Wingfoot Express. The blimp made several runs throughout the day, the more influential people who saw it, the better the publicity for the company. Shortly before 5 pm, the blimp began its last run of the day, flying out over the Loop, the better to be seen. While they were over the city, however, the blimp caught fire, and the passengers and crew were forced to jump, hoping their parachutes would be enough to save them. It was not only those in the blimp who were injured or killed; the blimp also hit part of the Illinois Trust bank, causing an explosion and killing many who were there at work. Devastating as this disaster was, there was worse to come for Chicago over the next two weeks, including a sensational child murder, a transit strike, and a deadly and divisive race riot, all exacerbated by politicians who failed to act as quickly or decisively as was needed. 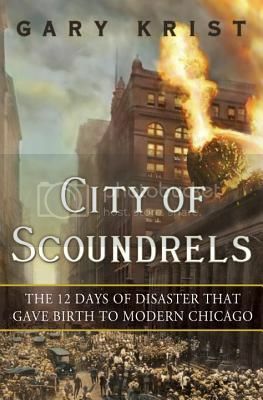 In City of Scoundrels, Krist describes the genesis of these disasters, the ways they fed into one another, and the ways the influenced Chicago throughout the remainder of the 20th century. He writes with a style that is reminiscent of Erik Larson’s modern classic of Chicago history, The Devil in the White City. If anything, in fact, Krist’s book is more accessibly written and easier to read, despite the lack of a serial killer in his narrative. The events of that summer are laid out in a clear and engaging manner, given proper context without going into extraneous and distracting details. City of Scoundrels offers an instructive and fascinating look into the history of Chicago. 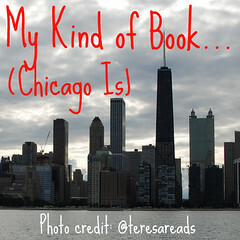 Chicagoans in particular should read this book, but anyone who enjoys a good narrative history is likely to be intrigued. Highly recommended. Beatrice Prior – who will soon reinvent herself as Tris – has never really fit in with her faction. She is just not Abnegation material. Luckily, in just a couple of days she and all the other sixteen-year-olds in this dystopian future Chicago will have the opportunity to choose whether to stay in their factions or choose a new one from among the five in the city: Candor, Abnegation, Dauntless, Amity, and Erudite. Leaving Abnegation would mean that Beatrice would have to leave her family behind forever, but staying would mean not being true to herself. Unfortunately, Beatrice isn’t any more sure about where it is that she does belong. Not Erudite, not after the lies they have spread about the people of Abnegation, and probably not Candor – only ever telling the truth isn’t particularly appealing – but where? Sixteen-year-olds are given a test to help them choose their placement, but Beatrice’s test is strangely inconclusive, a fact that she is warned to keep to herself. 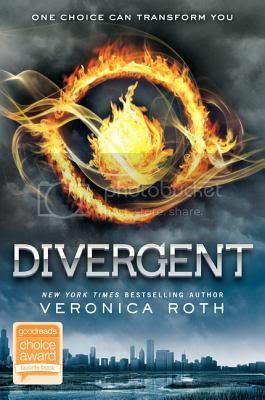 Divergent is a much-raved about YA dystopian novel. I found it enjoyable, but perhaps not as fabulous as everyone else seems to think it is. Roth is an incredibly engaging writer, and Tris is a great character, surrounded by other great characters. My only real problem was with the premise. The factions seem to have no idea what is happening in the world around them, for all intents and purposes the universe is no bigger than the greater Chicago area. Less believable, though, is the idea of the factions in the first place. Dystopian societies often have odd and somewhat unlikely governments and structures. The best novels, though give their odd structures a believable background. Either there needs to be a reasonable explanation for how they came to be, or they need to follow somewhat from the current state of the world. The factions of Divergent didn’t really do either. They provide a very interesting set-up to the story, yes, and they allow for great commentary on human nature, but I simply could not see where they came from. All this being said, Divergent is highly engaging, enough so that I do plan on reading the sequel, Insurgent, which is out later this year, in order to see if the world building is further developed. Somebody once asked me where I come up with my ideas for crimes and political scandals in my books. I told him I just open my eyes every day. I’m kidding. Sort of. I’m a Chicago lawyer, and I work in the political arena, so I tend to see a lot of interesting things. As the lawyer for the Speaker of the Illinois House, I spent two years basically trying to prevent Governor Rod Blagojevich from doing all the goofy and corrupt things he wanted to do. Then I served as the House Prosecutor who tried and convicted him before the Illinois Senate during our historic impeachment trial. So getting fodder for my plots isn’t the hard part. The hard part is topping reality. My best example concerns our dearly departed governor, Blago. In December of 2008, I was putting the finishing touches on a novel about a governor who becomes corrupt. It had some of your basic pay-to-play scandals, and I thought it would be an interesting character study as well. 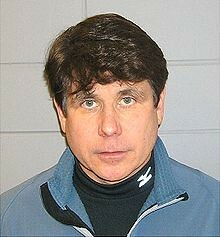 It wasn’t exactly about Blagojevich, but it’s fair to say that Blago inspired me. And then he did more than inspire me—he trumped me. Along came December 9, 2008, and “Blagojevich” became a household name with the news of his arrest. Compared to the sensational allegations that followed, my manuscript seemed completely tame. Truth, it so happened, had become far, far stranger than my fiction. What to do? Well, I had to go back to the drawing board. 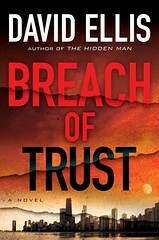 Even though the manuscript (now my upcoming novel, BREACH OF TRUST) wasn’t precisely about Blagojevich, I knew that everybody would have certain expectations about a novel of political corruption written by Blago’s impeachment prosecutor. So I had to dial up the volume on everything I was doing and spice up the scandals. I had to make my fiction stranger to keep up with reality. Voting early and often. Buying and selling a U.S. Senate seat. Putting your cronies on the payroll. Shaking down government contractors for campaign contributions. Two consecutive governors with felony convictions. The challenge for a Chicago lawyer isn’t coming up with ideas for crimes and scandal—it’s trying to come up with ones that haven’t already appeared in the headlines! 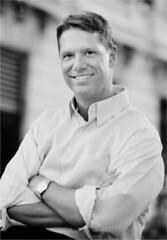 David Ellis is a graduate of Northwestern Law School and Chief Legal Council to the Speaker of the Illinois House of Representatives. He is also the author of seven novels the most recent of which, “Breach of Trust,” will be published by Putnam Books in February of 2011. His first novel, “Line of Vision,” won the Edgar Allan Poe Award for Best First Novel by an American Author. More information about Ellis can be found on his website or his Facebook page. Note: I am also hosting a giveaway for Ellis’ most recent two books. When you start paying attention to history, history starts following you around everywhere you go. And it’s not a silent companion. There’s the city you see and the city that once was, residing just out of sight. No bridge or street corner or neighborhood block is without a story, and once you’ve made it known to the universe that you’re interested in this sort of stuff—by, say, writing a historical novel—these stories seem to come pouring into your life. A few blocks from where we live in Chicago, for example, notorious mobster “Big Tim” Murphy—famous for orchestrating a robbery of $400,000 from a Pullman mail train—was gunned down in front of his house when he answered the door in June of 1928. The main road in our neighborhood (and many others on the east side of Chicago), Sheridan, is named for the Civil War general who restored order after the Great Fire in 1871. As you can see, a simple afternoon stroll conjures up one phantom after another. The ghosts currently haunting me reside in this striking pink stucco building in the shape of a Maltese Cross, on the corner of Sheridan and Bryn Mawr in the Edgewater neighborhood. This condo building is all that’s left of the luxurious one-thousand-room Edgewater Beach Hotel, built in 1916 by the Chicago architects Benjamin Marshall and Charles Fox—also know for designing the Drake. 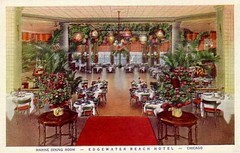 For the next thirty-five years or so, the Edgewater Beach Hotel was the most glamorous ticket in town. The icons of the era opted to stay here, from Sinatra to FDR and Eisenhower to Babe Ruth, Charlie Chaplin, Nat King Cole, Judy Garland, Lou Gehrig, and Marilyn Monroe. The hotel offered guests a private bathing beach and an eleven-hundred-foot promenade, along with on-call seaplane service to downtown. But it’s hard to imagine why they would have wanted or needed to leave the grounds. 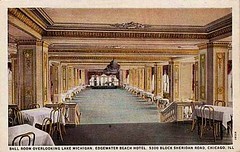 The place offered a formal dining room able to accommodate twelve hundred guests, plus an outdoor marble ballroom, golf and tennis courts, chocolate factory, soda fountain, post office, flower shop, and even its own film and radio studio. Benny Goodman and Glenn Miller both played here to packed rooms. When Gandhi stayed, the chef prepared special vegetarian meals and made sure fresh goat’s milk was delivered to his room each morning. You know what’s coming next, and it’s a heartbreaker. Eventually, the glory faded. New, more modern hotels sprung up downtown, and in 1951, the city of Chicago began to extend Lake Shore Drive north of Foster, cutting off this magnificent development from the beach—its major selling point. Business tanked and, eventually, the hotel was sold and its older buildings torn down. The remaining structure contains ground-level retail space and condos up above. Their sagging window-unit air conditioners dot the pink façade. Every day, hundreds of people walk by without giving a thought to this building’s former glory. 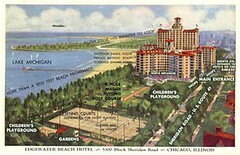 Thank you to Chicago writer Adam Langer for his Reader piece “Remembering the Edgewater Beach Hotel,” which was reprinted here and Chuckman’s Chicago Nostalgia for the old postcard images. Kelly O’Connor McNees’s first novel, The Lost Summer of Louisa May Alcott, was published in April by Amy Einhorn Books / Putnam. Kelly lives in Rogers Park and takes lots of walks that include frequent stopping to write things down on index cards. Mary Beth Raycraft is the translator for “A Parisienne in Chicago.” The book’s website is currently under construction, but does feature some interactive maps. While translating Madame Léon Grandin’s 1894 travel memoir, A Parisienne in Chicago, Impressions of the World’s Columbian Exposition, I also played the role of tag-along tourist. Since I am not a Chicagoan, I allowed Madame Grandin to lead me around the city, pointing out its most striking aspects. From strolls in Washington Park, busy circuits of shopping and culture in the Loop, and long days exploring the Exposition at Jackson Park, Madame Grandin took full advantage of her ten month stay to discover many different facets of the city. Mapping the neighborhoods and places in Chicago mentioned by Madame Grandin helped me to visualize her movements throughout the city. Madame Grandin and her husband, the sculptor Léon Grandin, lived in a series of boarding houses located near Jackson Park. Upon arrival at the train station in Chicago in August of 1892, they were greeted by a grueling heat wave and headed to the south side of the city. Since Léon was part of a team of sculptors working on the Columbian Fountain for the exposition, the boarding house at 3700 South Ellis Avenue was convenient to the fairgrounds. Although they complained about the miserly landlady and the insubstantial meals, their room offered a pleasant view of Lake Michigan. 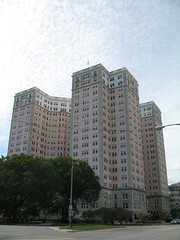 In search of more comfortable accommodations and better food, the Grandins moved to another rooming house near Drexel Boulevard, which Madame Grandin compared to the elegant Avenue des Champs Elysées. During the final months of their stay, they lodged at the Everett Hotel at 3619 Lake Park Drive. After spending several weeks exploring the south side of the city, Madame Grandin discovered that a tram car conveniently shuttled between Jackson Park and The Loop. The throbbing heart of the city, The Loop was the focus of many of her expeditions, including visits to the Athenaeum, the Chicago Public Library, and the Auditorium, where she and her husband attended the Inaugural Ball of the Exposition in October 1892. Madame Grandin also frequented the commercial establishments of The Loop, including the elegant Siegel Cooper department store and Gunther’s Confectionary on State Street, where she found the candies far superior to those in Paris and indulged her sweet tooth. Madame Grandin’s outgoing personality and curiosity about the city soon led to a flurry of social activity. Her friendship with two instructors at the Art Institute, Lydia Hess and Marie Gélon Cameron, enabled her to visit their studios and classes, located at the time in the Athenaeum. She even managed to obtain an introduction to Bertha Palmer and attended numerous receptions at Palmer’s elegant home on Lake Shore Drive. Although the primary reason for her trip was to accompany her husband to the Exposition, it seems that the city of Chicago was the most impressive spectacle of all. As Madame Grandin circulated in the bustling streets, explored exhibits at the fair, strolled in the parks, and socialized at parties, dances, and cultural events, she discovered a dynamic urban setting which, in many ways, she found preferable to her home city of Paris.